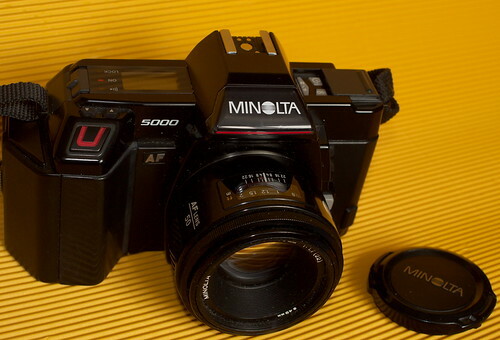 The Minolta 5000 (called Maxxum 5000 in the USA and α-5000 in Japan) was a "budget" version of the Minolta 7000. Many of the more advanced features of the 7000 and 9000 were left out on the 5000. The Minolta 5000 uses Minolta A-mount lenses and has both Program and Manual exposure modes. A remarkable fact is that this camera seems to have been sold together with a Minolta AF 50mm 1:1.7(22) lens (6 elements in 5 groups), probably an autofocus relative of the famous 50mm 1:1.7 Rokkor. Most later autofocus SLR models were sold with a zoom lens. A special feature of this AF Minolta is that it can be switched to a manual focusing mode in which additional red LED indicators in the viewfinder assist setting correct distance. Correct distance of the image centre is indicated by the green autofocus-confirm LED that also works in autofocus mode.